The heat that is given off by burning combustible fuels in the thermal power plant converts water into steam; the steam turns a turbo-alternator unit to produce electricity. Electricity is carried to areas of consumption over low-voltage distribution lines. The transformer reduces the voltage in order to increase the strength of the current; this allows a greater number of consumers to be served. Pipe through which gases produced by burning coal are discharged; these gases are first partially cleaned to reduce pollution. Device that uses the heat produced from burning coal to convert water into steam; the steam powers the turbo-alternator unit. Device that pulverizes coal into a very fine powder so that it burns more easily in the steam generator. 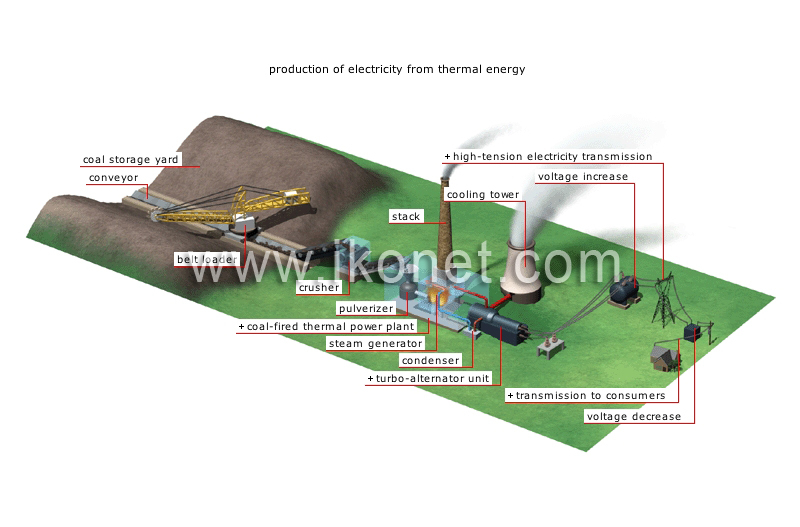 Plant that produces electricity from thermal energy by burning coal. Device that pulverizes the coal carried by the conveyor belt into relatively fine fragments. Area where the coal extracted from a mine is stored to ensure a continuous supply to the thermal power plant. Materials-handling device that consists of a conveyor belt (sturdy belt on rollers) that carries coal to the crusher. Device with a turbine that transmits the water’s mechanical energy to the alternator’s rotor to make it turn to produce electricity. Device that cools the heated water in the condenser through contact with the air; a small amount of water evaporates and the rest is reinjected into the condenser.